This article describes the components of the Classroom's Home tab in detail. The Classroom tab has two main components, the Weekly Calendar, and the Bulletin Board. All content presented on these boards is set by the teacher of the course. The Weekly Calendar summarizes all content that is relevant for the current week (similar to Current Assignments on the Portal homepage for students and teachers). The content is automatically updated based on assigned and due dates published by the teacher. When teachers publish units and lessons, the titles will appear as a drop-down bar, which the students can click to view the content inside. Teachers can click Assignments to see the details there. Note: Teachers cannot edit content while in the Classroom. To make changes to content, click Edit. Only teachers will see the Edit links at the top right of each board. 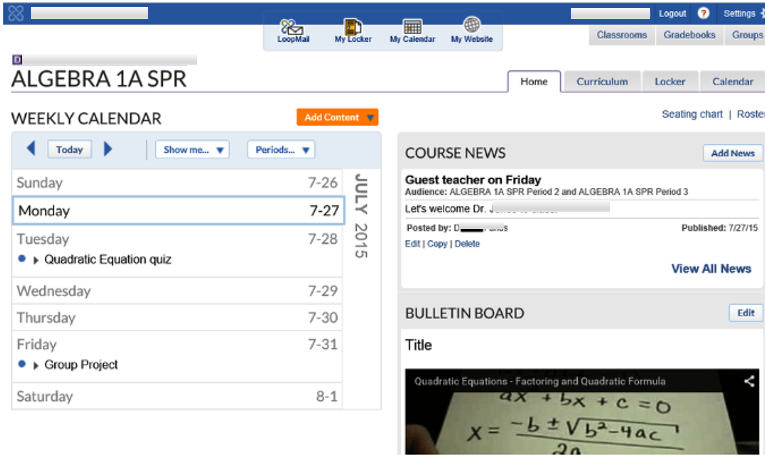 The Bulletin Board is an online version of the classroom's physical bulletin board. It represents a place where teachers can post class-related information for students and their parents. It is a great visual tool to present key information to students. The Bulletin Board allows teachers to add content such as pictures, links, or videos that will be shown on the landing page of the digital classroom. Note: Teachers cannot edit content directly from the Classroom. To make changes to the board, click the Edit link at the top of the board. Teachers can add-time sensitive news to the Bulletin Board. The news will appear as of the Publish date, and will automatically drop off the bulletin board on the Expire date. Teachers can also choose to add files and links to news posts.